So far, score is ghost 1, photographer 0, as we join a troupe of ghost trackers at state park. CARROLLTON – They stood around the bed, their hands outstretched, reaching for something unseen. It was a spirit, they said. A ghost. This ghost was trying to tell them something. They were convinced that if it could just find the energy, it could talk. So they extended their arms, in a giving way, to lend their own energy to him. “We thank you for coming and talking with us tonight,” one member told the spirit. In the back of the room, the Skeptical Reporter folded his arms and sighed. The Skeptical Photographer kept shooting pictures. But they saw nothing. They heard nothing. They felt nothing. The assignment was a bust. Still, the photographer kept shooting, the reporter kept watching. The Ghost Hunters kept talking, supposedly communicating with the spirit of an old man. Minutes passed. The photographer stopped her work and walked to the reporter’s side. “Look at this,” she said scrolling through a series of digital pictures. The photo was unmistakable – while it showed the Ghost Hunters, arms outstretched, palms down – it also showed something on the bed. A pink, translucent cloud. “What do you suppose that is?” the photographer asked. The reporter shook his head. He had no idea. PsyTech was born out of the curiosity of Nicholasville resident Starr Chaney, who is certified in ghost hunting. She learned how to take the correct digital photography, test for voices and measure the amount of energy in the room, all supposed indicators of spirit activity. PsyTech is not a business and charges no money. Its handful of members are interested in finding haunted places. They tour the state, and sometimes travel farther, to find evidence of ghosts. Since the group was formed in 1997, they’ve investigated 30 sites. Their crew expanded to include self-proclaimed medium (and 21-year Navy veteran) Denita Ross, of Robertson County, independent documentary maker Charla Stone, of Louisville, and Starr’s daughter, Jessi Chaney. “I was raised in Eastern Kentucky, where we talked about the haints,” said Starr Chaney, who sells candles as her day job. Recently the Chaneys, Ross and Stone traveled to Carrollton’s Gen. Butler State Park. On a Friday night, they made their way to the Butler-Turpin State Historic House – a place supposedly haunted since the 1930s. Night had fallen and the group unloaded their microphones and cameras, batteries and cords. Evelyn Welch, the museum manager of the park, works at the house and knows the legends that people tell. She wanted to sit in. “I guess I don’t know what I believe,” she said. A clock in the dining room hasn’t worked for years, but sometimes, it chimes for no reason. On occasion, Welch has heard children playing outside the house, yet she is always alone. Built in 1859, it was the home of Maj. Thomas Langford Butler, who assisted Gen. Andrew Jackson in the War of 1812, Welch said. 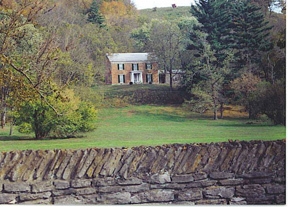 Butler’s daughter Mary Ellen then lived in the home with her husband Phillip Turpin and their six children. Mary Ellen lived there only a year, dying of tuberculosis. Turpin children also died of the disease. The Ghost Hunters used dowsing rods to communicate. The group tried to communicate with a 6-year-old ghost named Eliza. Through the dowsing rods, Eliza said she knew the matriarch of the family, Mary Ellen Turpin. In complete darkness, Jessi Chaney asked Eliza to play with her. With the group watching the scene from the monitor on the night-vision camcorder, Chaney extended her arms into the air. The reporter looked at the screen. Points of light popped all around Chaney’s body, like fireworks, or shooting stars. He looked back at Chaney, and as his eyes focused he saw only the young woman, her arms extended into the air. He looked again at the video camera screen. The lights continued to pop. That was Ross’ explanation of the strange lights on the video screen – that it was the spirit of Eliza. After a few more minutes, the battery in the video camera was drained. Strangely, three spare batteries – all fully charged – also were dead. Outside, thunder rolled and lightning streaked across the dark sky. The photographer was eager to see if she had caught any orbs in her own pictures. As they left, the reporter asked Welch if she’d seen anything to warrant her believing in ghosts. The story – the ghost story that held so much promise – is a dud. Yes, he had seen the popping lights, and the batteries had been drained and the photograph showed a pink cloud. But really, did that suggest anything more than bad batteries, bad light in a photo, or some form of electricity in the room? Probably not. In his office, the phone rang. It was the photographer. “I can’t find my pictures,” she said. The photographer had loaded her memory card into her computer, uploaded her photos and even begun to choose which ones would appear in the newspaper. A colleague watched her do it. She then left to shoot other pictures, and when she returned, the photos, and the file she saved them in, were missing. “They’re just – gone,” she said. The reporter was speechless. He couldn’t help but think back to Ross’ words. ‘The spirits will talk to us,’ she had said. Through our phones. Our televisions. Our computers. He didn’t think about it long. There was a story to write. Later, a recovery program was used to try and find the photographer’s pictures. Photos were found from Wednesday and Thursday. They were found from Saturday. But for Friday night – the night the reporter and photographer went ghost hunting with PsyTech – not a single image appeared. Activities include: Tour of the Butler-Turpin house, meals, history of the grounds, guest speakers, digital night photography and accommodation at the park lodgings.